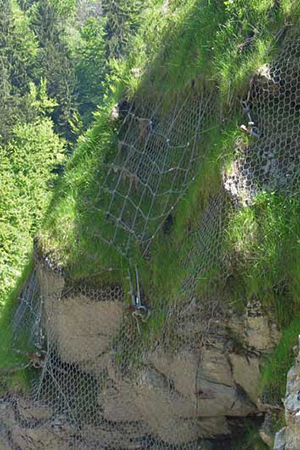 The erosion of existing slopes can be prevented by soil nailing or, if nails can be driven in, then by anchoring or by covering the surface by steel mesh fastened diagonally. This technic is also suitable to created steep slopes, typically having 55º for soils, but even steeper slopes can be constructed using this method. Hungarian conditions call for rock protection only in few places, therefore it does not have a tradition. However, where it is required, it is practical to use the right solution. Gradex Ltd. possesses the highest quality Swiss rock protection system. Through its use rockfall onto roads or railways, incidentally causing accidents, can be avoided with high certainty. The system offers a very wide range of solutions to select your solution starting from the retaining of large rocks to the controlled rolldown of small stones, with the best value for money.